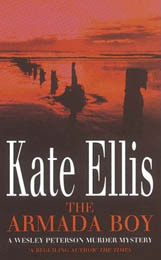 I like Kate Ellis’s colour co-ordination, and tell her so. “Yes, the charity shops in Cheadle are wonderful”, she says and laughs. She does that a lot, I discover, as we keep bumping into each other. The bumping into her is a little weird in itself. We live only a few miles apart, but it takes the Bristol CrimeFest to bring us together. It feels good to meet on neutral ground, somewhere we can be equals. Except Kate murders far better than I do. The Royal Marriott has set aside a part of their lounge for the CrimeFest, so we make ourselves comfortable in our corner, once the confusion about where to meet has been solved. Even when we didn’t try to meet at all, we still ran into each other several times a day. It’s that kind of place. It was the mobile library that started me on Kate’s books. I think I first encountered her second or third Wesley Peterson crime novel, and loved it. The library supply ran out after a few Wesley Peterson books, and then no longer came to my street, so I began buying the books as soon as they arrived, and eventually managed to find the first book as well. The series, which is based in an alternate Devon, can count both as cosy crime and as historical crime, judging from the discussions on these topics in Bristol. When asked if she is more famous in Devon, Kate says “Yes, I seem to have really caught on in Devon, actually.” She doesn’t do all that many public appearances, but is more likely to give a talk in a bookshop or library while she’s in Devon. Kate has apologised to the people of Dartmouth for having made their beautiful town the “crime capital of the South West”. I have long enjoyed my Devon crime trips in the company of the divinely handsome (think Sidney Poitier in Heat of the Night) detective Wesley Peterson. Strolling along the sea or driving down narrow country lanes, or drinking in the charming pubs, feels so good, you can almost forget the murders. Though, it seems Kate didn’t have Poitier in mind (“he’d be a bit old now! ), and quite fancies Adrian Lester for her policeman. “He would make a lovely Wesley, very thoughtful”. I want to know why she made her Devon detective black. “I don’t know, really. I’ve got a friend from Trinidad, from a medical family. It just came to me, this idea of the very educated family, and he’s the odd one out.” Though I wouldn’t call Wesley uneducated. He’s got a degree in archaeology, and his background sets the scene for the other half of the books. Wesley’s mate Neil Watson is an archaeologist, and whenever Wesley has a fresh murder case on his hands, Neil just happens to discover a nearby historical crime of a similar nature. And there is almost always some kind of bond between the two crimes. Between you and me, I’d say that Wesley and Neil ought to have cottoned on to the fact that their cases are always connected, and they should have a heart-to-heart much earlier, and things would be solved sooner. But that wouldn’t make much of a story, so perhaps not. Kate took part in the CrimeFest panel on sidekicks, and Wesley has at least two of them. Not only does he have his own Dr Watson (Neil gained his title after he did his PhD, and it was not something that Kate had planned in advance), but he also works closely with his superior officer, Gerry Heffernan. Gerry comes from Kate’s hometown Liverpool, and she particularly wanted both her detectives to be outsiders in Devon. The more I question Kate on how she planned her characters, it seems that she just sat down and wrote about them, letting them grow without too much advance planning. On that basis I have to say it has worked very well. And the question I didn’t put to Kate was whether she could even imagine what a long series she’d end up writing. It might have made a difference, but not all writers can set out intending to write six, let alone twelve books. And now Kate has a new series of books, with the first, Seeking the Dead, out this August. The Joe Plantagenet series is set in a thinly disguised York, and whereas the name had me thinking of something more historical, it is in fact modern, but with “a slightly supernatural background”. One of Kate’s sons studies at York University, and when she visited him there, they went on a couple of ghost walks, and the stories Kate heard then, immediately inspired her to write her new books. So far Kate has finished the first two Joe Plantagenet novels. I had begun to have concerns that two crime series at the same time might mean half the number of books for her fans, but Kate says “at the moment I’m ahead of myself. I’m quite well organised”. With the Wesley Peterson books she had written two before the publishers took them on. Kate can write a book in nine months, so there is hopefully not too much to worry about for the readers. Asked about her historical research she says she reads a lot, but “I tend to know what I need”. For a new period in history she “might read a broad sweep. It’s quite interesting, really”. For A Cursed Inheritance Kate read up on the early settlers in Virginia. She “found it very interesting how they wrote home”, and that comes across in the book, and it was one of my own favourites as far as the historical side is concerned. I’ve wondered why Kate’s books keep getting longer, as the series goes on. “I don’t know”, she says, “I’m not sure. It just happens.” I ask where she writes, and Kate is one of “the writing in a shed at the bottom of the garden brigade”. I can’t resist the nosy question of whether she can live off her writing. She couldn’t to start with, certainly. When she began writing, her children were small, and it was a choice of going back to work, or try her hand at writing. She decided that she’d “have a go. It’s what I’ve always wanted to do. If we’re economical, I can”. I’d guess she has to economise a bit less these days. And there’s that research she “has” to do, down in Devon. But rather handy, I imagine, to be able to research and holiday at the same time. Kate’s interest in archaeology seems to have rubbed off on her younger son, who is now studying the subject at university. They “went on a couple of digs together”, she says. And she can ask him for advice when she needs it. One of the first books Kate wrote was Devil’s Priest, but at the time “historical crime was oversubscribed”, so nothing happened to it. She knew a little publishers in Liverpool, who offered to publish it for her. It’s a story with close local ties for Kate. In a church in Cheadle she found the story of the Abbess who had to return home after the dissolution. She had been a powerful woman in her own right, but now had to live quietly, as women were supposed to. Kate “felt she’d make a wonderful detective”. Kate has also written a good number of short stories, and I wonder if they have been collected anywhere, to make them easier to access, but she says “not at the moment, but I wouldn’t rule it out”. As yet they can only be found in anthologies, which may require some detective work for her fans. Kate’s books are listed on her website, as long as you find the right Kate. Google her, and you will find an Australian politician. “With scandal”, says Kate and laughs. “My website went crazy the day it happened”. It’s been great meeting Kate. Until now I had managed to miss her, whether in bookshops and libraries, or the latest event which took her to the local shopping precinct in aid of The Year of Reading. The library had the idea of having an author reading in their marquee. “Not a good idea, when you’ve got people singing songs from Oliver next to you.” She was moved into an abandoned shop, and says she had a sore throat for ages after all the shouting. For me it made a wonderful birthday treat to interview someone whose books I like so much. And we still kept running into each other in Bristol, comparing notes on panels and the gala dinner, and we were both awake and up for the panel at nine on the Sunday morning. Admittedly, Kate had to, as she was on it. Even at that hour she continued to laugh a lot. But don’t let that fool you; Kate is a professional killer. I really enjoyed this interview, thanks so much. 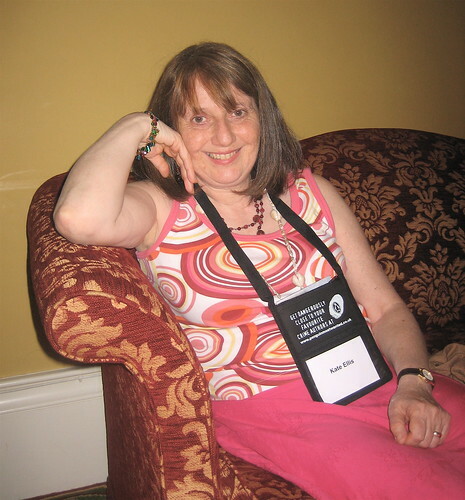 I sat next to Kate at the dinner at CrimeFest and very much enjoyed talking to her, though I am ashamed to say I have only read one of the Wesely series. I have family connections in York, though, so look forward to the new series. She’s nice. She’s just very normal and friendly and cheerful. (I’m not saying all other writers are the opposite…) I felt as if I’d known her a long time. Kate fits the description of your typical nice Englishwoman, who sits at home and murders people on the quiet. As one of the many ‘lurkers’ that read your blog and these interviews, I wanted to say “Thank you”. I’m now half-way through the 3rd Wesley Peterson book, having to decided to try the first one after reading this interview, and enjoying them very much! Thank you, Lisa. It’s been a while since anyone admitted to having started reading anything because of me, so it’s reassuring to hear. Particularly comforting that anyone’s read more than one in a series. I like the Wesley Peterson mysteries, too. I am so glad I got to know the author via “bookwitch”. I think she has posted on Susan Wiggs blog and I read that one,too. I love the Wesley Peterson book, they are really well written and as a former archaeologist I love that Kate represents the world so well. I’m so pleased that she imagined Adrian Lester becuase that’s exactly who I imagined. It must be my age that makes me have a different Wesley. But I’d be quite happy with Adrian Lester in a film.